Chickpea is a legume whose seed resembles the one of soya or dried green peas; this beige colour plant is used for various stews or as a side dish, but for many reasons this is a true golden stew. This highly valuable food for human diet is an important source of proteins that stimulates the absorption of iron and calcium. Moreover, it improves spleen function and has a diuretic effect. 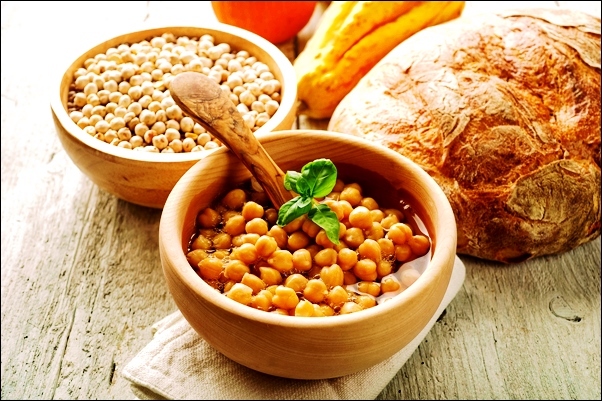 Although chickpea is unjustly neglected in everyday nutrition, vegetarian diet features this food in many dishes. It is rich in minerals and B-complex vitamins. Simmer garlic and onion using olive oil, add pumpkin that you’ve previously chopped into small cubes, add tomato sauce, laurel, oregano and broth just enough to cover the vegetables. Leave the vegetables to cook until it softens and add some salt according to your taste. Take out the laurel and blend the rest of the vegetables; add the remaining broth and cooked chickpea. Just before the cooking is over, add grated tofu and sprinkle with a finely chopped parsley leaf. You can replace chickpeas with beans; the taste will still be amazing. Having troubles with water retention?